As a light and airy option for your bread basket, popovers taste great fresh from the oven and topped with butter or jam. In a medium bowl, whisk together the flour and salt. In another bowl, whisk together the milk, butter, and eggs. Make a well in the flour, pour in the milk mixture, and whisk to make a smooth batter. Set batter aside for 10 minutes. Lower the heat to 350 degrees F. and continue to bake the popovers for 20 minutes, at this point they will be golden brown. Right after removing the popovers from the oven, poke each one with a paring knife to release steam. 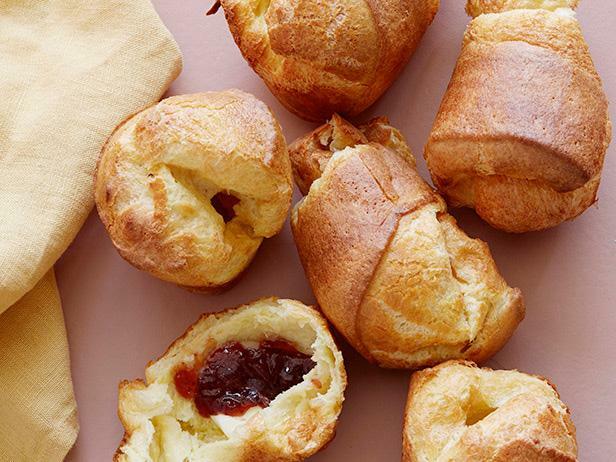 Turn popovers from the pan and serve immediately with butter and jam.